Blood stem cells can be found in the bone marrow, the soft, spongy interior of bones. Blood stem cells are also called hematopoietic stem cells and are responsible for resupplying blood cells. The blood cells are the red blood cells called the erythrocytes, the platelets which help in blood-clotting, and the leukocytes which are the white blood cells of the immune system. The process where the body replaces these blood cells is called hematopoiesis. 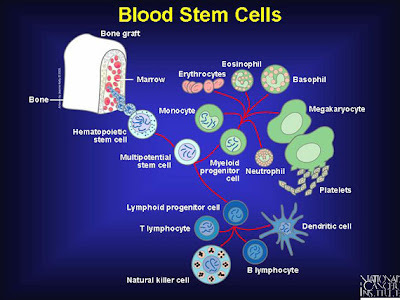 The stem cells in the bone marrow matures and starts to transform to either of the three types of blood cells. This process goes on constantly in the human body. The body also reacts to certain conditions and starts producing more of the blood cells such as movement to a high altitude and serious bleeding. These types of conditions require more blood into the blood stream to compensate for the changes encountered by the human body. For the first time, scientists at Fred Hutchinson Cancer Research Center have transplanted brain cancer patients' own gene-modified blood stem cells in order to protect their bone marrow against the toxic side effects of chemotherapy. Initial results of the ongoing, small clinical trial of three patients with glioblastoma showed that two patients survived longer than predicted if they had not been given the transplants, and a third patient remains alive with no disease progression almost three years after treatment. "We found that patients were able to tolerate the chemotherapy better and without negative side effects after transplantation of the gene-modified stem cells than patients in previous studies who received the same type of chemotherapy without a transplant of gene-modified stem cells," said Hans-Peter Kiem, M.D., senior and corresponding author of the study published in the May 9 issue of Science Translational Medicine. By giving bone marrow stem cells P140K, which is a modified version of MGMT, those cells are protected from the toxic effects of benzylguanine and chemotherapy, while the tumor cells are still sensitive to chemotherapy. "P140K can repair the damage caused by chemotherapy and is impervious to the effects of benzylguanine," Kiem said. "This therapy is analogous to firing at both tumor cells and bone marrow cells, but giving the bone marrow cells protective shields while the tumor cells are unshielded," said Jennifer Adair, Ph.D., who shares first authorship of the study with Brian Beard, Ph.D., both members of Kiem's lab. "Glioblastoma remains one of the most devastating cancers with a median survival of only 12 to 15 months for patients with unmethylated MGMT," said Maciej Mrugala, M.D., the lead neuro oncologist for this study. Researchers from Washington State University, the University of Washington, Dana Farber/Children's Hospital Cancer Center and the Harvard Medical School contributed to the study. The research was funded by grants from the National Institutes of Health and the Heath Foundation.